The events and environment of 17th-century Virginia come to life. 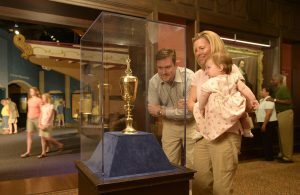 Begin your visit to Jamestown Settlement with the new dramatic documentary film, 1607: A Nation Takes Root, shown every 30 minutes in the museum theater. The film traces the evolution of the Virginia Company that sponsored the Jamestown Colony, examines the relationship between the English colonists and the Powhatan Indians, and chronicles the arrival of the first recorded Africans in 1619. Expansive gallery exhibits explore Jamestown’s beginnings as a business venture, the impact of European colonization on the Powhatan Indian culture, and the origins of the first known Africans in Virginia. 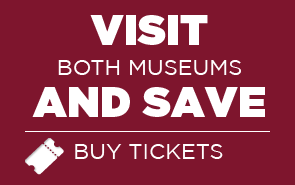 Hundreds of objects from 17th-century Europe and Africa and Virginia archaeological artifacts are integrated into the gallery setting, which features three-dimensional structures and small theaters. Click on the image below to try our new quiz. 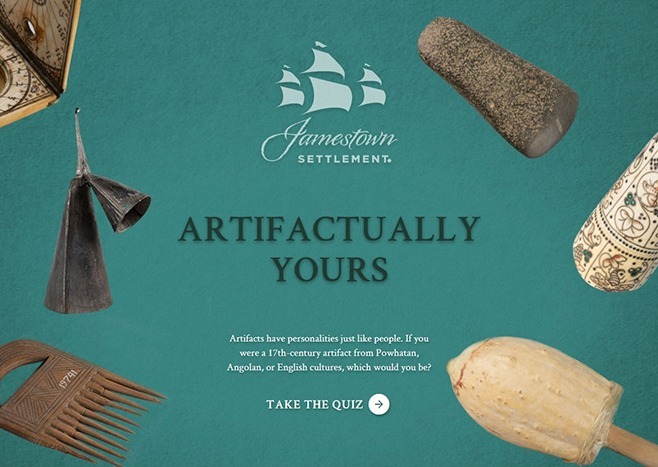 If you were a 17th-century artifact from Powhatan, Angolan or English cultures, which would you be? Take the quiz and share the result.